This is Rufina. She’s new to our household. She’s quiet and doesn’t take up much space, mostly sits on her perch or in her ceramic nest all day. She moves around slowly. If you are really gentle, she lets you pick her up. We sit by the pond together in the morning, before everyone else gets up. Last Thursday, I answered a friend’s call on Facebook for someone to take this chicken. Isabella and I drove to my friend’s house in the South Valley, put her in a bin, and brought her home. I didn’t think she’d actually still be alive today. The neighbor gave us fresh chickens last night for cooking up. He shot them in the head with gun and handed them over the fence. We bagged them and put in freezer for today. Evan gets home, opens freezer and one bird is perched fully alive, very cold, and pissed off. Chase ensues… !! We now have a blind undead chicken in our yard. I’m not sure why anyone would shoot chickens in the head. But when I read the story, I couldn’t help but admire this chicken’s tenacity. She is courageous. She made her way out of a plastic bag inside a freezer and survived for thirty-six hours. After being shot in the head. I figured any animal that fought that hard to live deserved a little help, if only for a day or two. The chicken hasn’t made any effort to eat like a normal chicken. Because, of course, she can’t see where to peck. 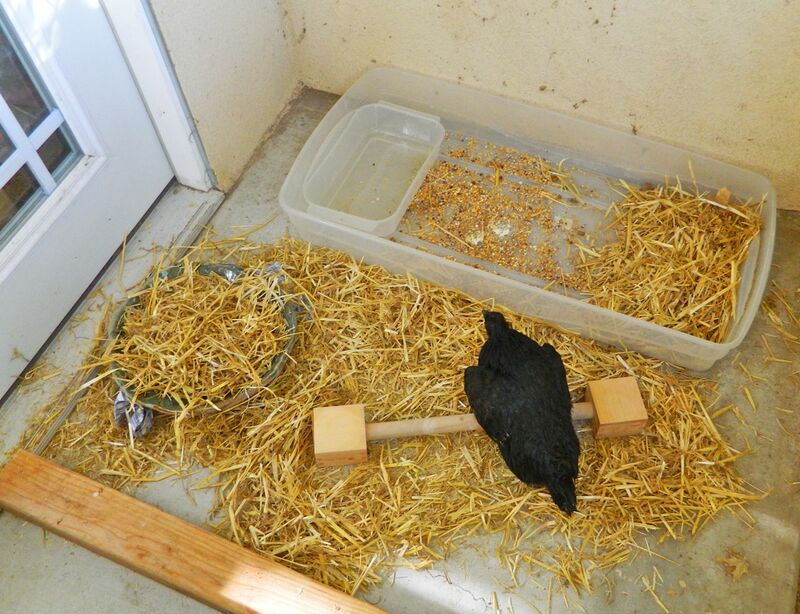 (There isn’t much point in force-feeding a blind chicken.) But she does drink, so I’ve started blending up borrowed chicken food and water and giving her that. She seems content, grooming herself sometimes, showing no signs of pain or anxiety. And still, she will die. 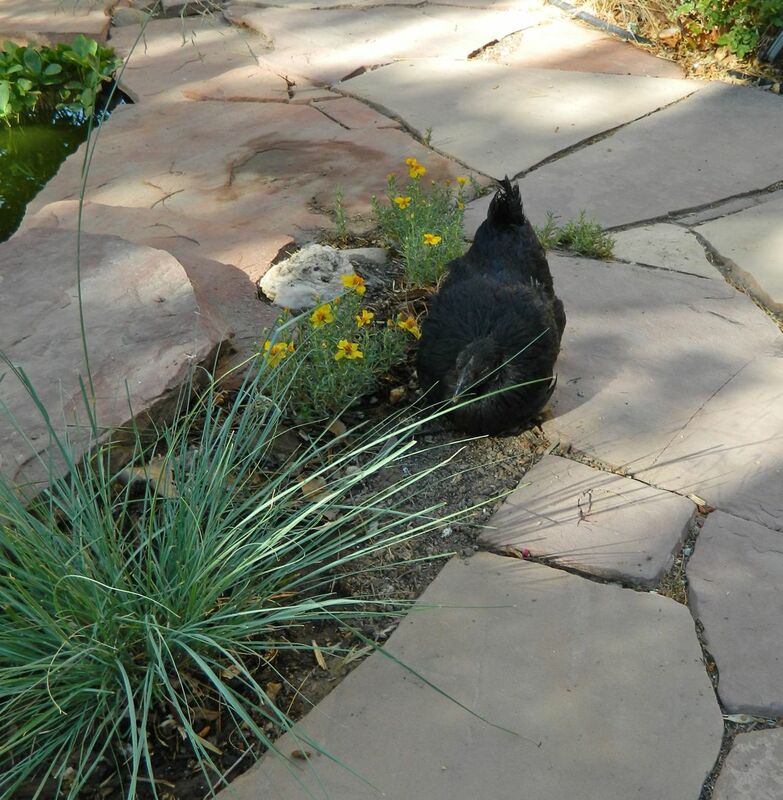 But until then, we will enjoy each of her borrowed mornings by the pond, the sound of birds and running water, the sun on her feathers, expecting nothing. I’m not sure why I have a blind, undead chicken in my studio. But here is one of my favorite poems, by Laura Gilpin. She is wonderful. I am glad you went and got her. She may surprise you and stick around for longer than you may imagine. Scatter food around her water bowl, too. We have had a number of blind birds who knew to look around water for food. Thanks for the information and support, Red! It’s funny, when I think of chickens and roosters, I always think of you — maybe because of your mom’s collection! I’ll try that with scattering food. Were the blind birds you had born that way, or did they become blind later? Both. We had a peacock who wad blinded as an adolescent and geese which were born blind. Their hearing gets much better, and they learn to see with their feet. I’m a fan of that hen! Let her live. Do a horse feed-basket number around her neck… should (might) work a charm. Thank you John! I’m hoping she’ll benefit from all the psychic fandom and love coming her way… Hmmm, feedbag. Didn’t think of that one but it might just be terrifying for her. Plus, how would I strap it onto her little chicken head? Might require a full-body harness and after all that, spoon feeding might be easier. But thanks for the suggestion! What a blessing. Ruffina is a lesson for us all. Thank you for saying yes to rescue and nurture in the face of our own blindness. I hope you’ll change my pampers when the time comes. Yescue, yes to rescue 🙂 I can handle blind chickens but I’ll have to work my way up to humans in Pampers… isn’t that what grandchildren are for?? At least with you, it sounds like the chicken will enjoy whatever time it has left. Thanks, Guap. I’ve gone back and forth a lot about if it’s cruel to “keep” an animal like this alive. But then I think, I’m not keeping her alive, she is. So… yeah. I hope it’s a peaceful time for her. Somehow this whole story works for me, and I know it’s not fiction. I can see you and the half-dead chicken having a cup of tea together and taking it all in. I hope Rufina will make it! Thank you for saving her, at least for now. I’m going to share with a couple of my friends who raise them – they may have tips, at least for feeding. Tracy, Joanne, and Candace. Good luck! Thank you Heather, I would love some advice from people more expert in the ways of chickens than I…. Laura, you have a very big heart – and you also have a fantastic sense of humor/wonderful approach with your writing! I do hope Rufina thrives in the warm and lovely environment you’ve given to her! OMG I can’t believe this story! Amazing. God bless you for giving this chicken a home. What madness to shoot a chicken. I hope Rufina learns how to eat. I love that you sit by the pond together in the morning. Best of luck to you. Wow, glad you saved her. Reminds me of Mike the Headless Chicken, who lived for 18 months after meeting the axe. I think he finally succumbed to a kernel of corn. Apparently no one knew how to give a headless chicken the Heimlich maneuver. Yeah, Mike the Headless Chicken has a statue to himself in Colorado. Pure celebrity. I read about how they fed him — with corn straight down the gullet! Never underestimate the will to survive, I guess. She is a miracle! One that I couldn’t let be killed “twice”. But she’s done all the rest in recovering her life. Thanks for reading! She’s a lucky little chicken. I love Rufina’s story. My daughter raises chickens. “KickenWing” has only one wing. This has not stopped her in the least. Chickens are fun to watch. And I love all the variety of color they have to offer. Thanks for stopping by, and I’m so glad you love the story. I never planned to keep chickens (although we had them as kids for a while) but I’ve learned so much. They are smart and curious and very entertaining (sometimes maddening :). Great name for your daughter’s chicken! Thanks! She enjoys them very much.